This is a first world problem and I think it's important because we are trying to encourage public transportation, but when things like this happen the whole effort takes a back seat to us using our own private cars because we can depend on our cars. I had posted the NY Times story recently called, "Owning a car will soon be as quaint as owning a horse," but not at the rate our public transportation is going. The last few times I tried to take mass transit, it hasn't worked out. It think the problem is that there aren't enough trolleys, Ubers or Freebees on the streets during peak times and it defeats the whole purpose. 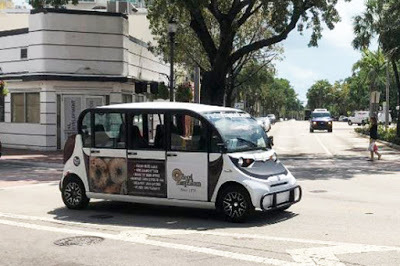 During the Coconut Grove Arts Festival and Boat Show it was near impossible to get a Freebee and that's when you need it because it's near impossible to find parking during that time. They changed the trolley route, making wait times double, so I have not taken it since. I like Freebee but it's not reliable and Uber is iffy. On Saturday night I was headed to the Opera at Regatta Park. I didn't think I would find parking, so I decided to take Freebee. I summoned the app and it told me the driver would be by to pick me up in five minutes, then it went down to 4, 3, 2 and 1 minute and .... nothing. So I canceled the ride and started over. I did this about four times when finally a driver responded, but he told me there would be a 45 minute wait! 45 minutes! No. That wasn't going to work. I then called Uber who arrived fast, and that was great. I didn't stay for the full opera event because I had to be somewhere else, so I summoned Freebee after a bit and I got the same thing as before - no response. I could understand if everyone was leaving at once, but this was an odd time and there should not have been such a long wait. So I walked over to City Hall and summoned Uber because I felt it would be easy for the driver to find me there. By mistake I summoned a pool car, that's when you share a ride, but I didn't want a pool. Pricing was basically the same for a private ride so I would have chosen that. I didn't know how to cancel the ride, so I went with it. It was a long wait and with the pool, you have to walk to locations to be picked up, they don't come right to you. I was at City Hall and the app told me to go to the southwest corner of Pan American Drive and S. Bayshore Drive, which isn't a thing. There is no such corner, it is the entrance to Grove at Grand Bay condo and the bank next door. So I walked there, actually I ran because the freaking app told me that the driver would be there in a minute, so I ran from City Hall to the Grove at Grand Bay condo. Only to wait, and wait, and wait in the dark. After about 20 minutes, the app cut off and and said something like, "Start your trip again." So I had to start from scratch. And they charged me a $6.00 cancellation fee on top of that. This happened to me before, the drivers just apparently get flustered and dump the call, leaving people stranded in the middle of the night. I ended up calling another Uber, a private car this time, and it arrived fast and got me home. I don't think Miami will ever get mass transit right. Public rapid transport improves the economy and raises the average American's standard of living. The problem with Miami's transportation system is our elected officials and operatives feeding from the treasure chest of special interest. It has become fashionable recently to call anything that can be used in a free society to makes life easier for the middle class and make working for an employee more efficient as Socialism with a capital S. That is because our elected officials and their staff want to please their masters who are elitists hell bent on bring back a archaic patriarchal society, a form of Socialism for the few. If public transportation is bad then collecting and expanding tolls is obstruction and a crime. How about we scratch all of public transit since EVIDENTLY the government does not know how to manage it properly. We lax the regulation on private companies providing transportation e.g lyft, uber, scooters etc, and allow competition to drive the prices down. It's clear private companies do a much better job. I'll never understand why people really believe that government has the motivation and capability to manage public transport. Everyone drinks the kool-aid and believes that it will eventually get better. That one day we'll have the right city government to manage it properly. Totally agree, privatizing this sector is the only way it will push forward. Look at the BrightLine "Virgin" train now, anyone that has ridden on it sings its praises. Our county commissioners are stuck in the dark ages with their head in the sand like carollo wanting for an expanded BUS transit. R U kidding me that in 2019 this is his forward thinking idea?? term limits on these assholes and some new tech leading alternatives opposed to horse and carriage band aids. Maybe we can get some of these billionaire developers to give back to the city with a donation towards the greater good when they win EVERY big bid in town? hello Terra and GinANDTonica heres looking at you kid! Sane and serious publicly funded transportation works, it has been done in many places. With your rationale why should we let government manage water, roads, airspace? Today the problem with resolving our societal problems is more difficult because of how politicians have divided us and labels us on political and ideological lines pretending we have a choice when in essence we have a single party system serving corporate lobbies and not the citizens. We have arrived here because cultures always starts degenerating after a long spurt and why now we have an Idiotacracy in place. Basically cultures get infested with their lowest denominators and that is what is happening to us because we have been overtaken by the fungi of our society wheeling and dealing with our lives and we the people chose them. Do not ever underestimate the stupidity of the masses. What you are saying is basically let Coca Cola and Pepsi manage our water department. Is that not like letting Republicans and Democrats run every aspect of our lives? You cannot have busses stuck in traffic and call it rapid transit. Rapidly flowing rail transport is real public transportation. The rest is putting lipstick on a pig, a waste of tax payer funds. I tried the trolleys because they were supposed to run every fifteen minutes so I thought they would get me to places in a reasonable amount of time the last few times I tried to use the trolleys I had to wait half an hour to forty-five minutes. When I tried to talk to someone and lodge a compaint, there was no contact info either ont their website or by calling the phone. And we're only realizing this with an additional 700 seat Playhouse?